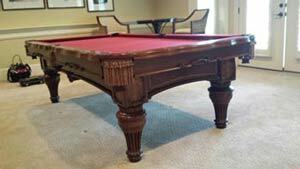 Professional pool table installation for all brands, makes and models of pool tables. Our experienced pool table installation service will do it right. Our pool table installation service uses a covered trailer while servicing the entire metro Atlanta area. No stair charges, all makes and models of pool tables. We will install pool tables outside of the cities listed above. A mileage fee will apply. On average it takes us 1.5 to 2 hours to inspect and install your pool table. This does not have to be done everytime your pool table is reinstalled. Felt is reuseable up to 3 times provided the felt is not in excess of 7 to 10 years old. There are somethings that you may want to consider ahead of time to make the installation go smoother. Before we install your pool table, you want to consider the color, condition and age of your felt. More often than not, the color scheme in the new room differs from the old home. If the felt on the pool table is older than 7 years, now is a good time to have it refelted. As felt ages, it gets weak and may tear when we try to restretch it. If we plan for refelting while installing the table, we offer discounts on our refelt service. 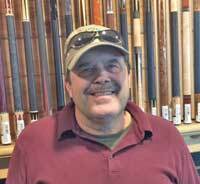 See our pool table refelting color chart for color ideas. My pool table needs to be installed but is located in a storage facility. If your pool table needs to be installed and is located in a storage facility we can bring the disassembled pool table to your house. We charge an additional $50.00 for this service. Provided that the storage facility is located in our regular delivery radius. Use our room dimension chart to determine the location of your pool table in the new room.